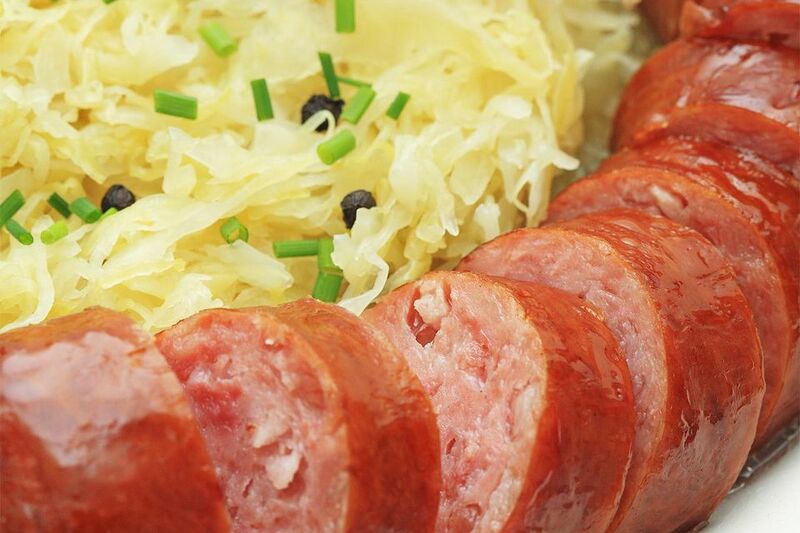 Polish sausage and sauerkraut are a perfect combination. This recipe shows off the duo in a simple way, adding the taste of apples, bacon, and brown sugar to create a flavorful dish. It's perfect for potlucks and tailgating, Super Bowl parties and family reunions, or just dinner with the family. The recipe can easily be doubled, tripled, or quadrupled and will be just as tasty. Simply increase it to fit the size of your crowd and give it a little extra time in the oven. The best flavor comes if this dish is cooked the night before. The next day, just warm it in a slow cooker and it will be ready to serve. In a large bowl, combine bacon, sauerkraut, smoked sausage, apple juice, brown sugar, apples, and caraway seeds. Transfer to the prepared baking dish. Cover and bake for 1 hour (1 1/2 hours if you increase the recipe). Stir after 30 minutes, and add more apple juice, if necessary. Cool in an ice-water bath, and refrigerate overnight. The next day, transfer it to a slow cooker. Heat on low, stirring occasionally, until ready to serve.